October 2005: It is reported that the Resurrection church (not the convent) will be demolished to build a Rite Aid pharmacy. The founding pastor's name was Fr. Augustine L. Ganster (1911-1938). He is buried on church grounds. Marie L. Creedon, creedonml@aol.com, adds, "Father Lyons is currently pastor of St. John Fisher parish in Boothwyn, PA."
1/25/2001: Additional listing of priests compliments of Terry McHugh, tomch58@yahoo.com. Terry also recalls, "I was baptized, married and had two of my children baptized there. Resurrection was a huge part of my life and it's closing will remain as one the saddest memories in my life." 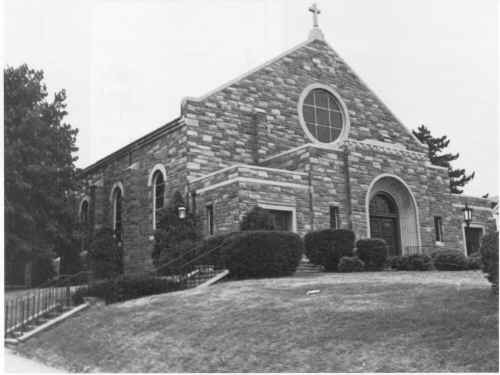 Church History Resurrection was founded in 1911 and was one of the six Chester parishes that closed and merged into Saint Katherine Drexel parish in 1993. The Resurrection Church building is now a Protestant church - River of Life. The "Old Building" of the school (Resurrection) is now the Chester Charter School and the "Annex" is currently occupied by Headstart, who also uses the old Rectory as their offices. The convent is currently occupied by the Sisters of Mercy - they run a home for mothers and children with AIDS from there. October 2005: It is reported that the church (not the convent) will be demolished to build a CVS store. We, the Parish of Resurrection, have reason to celebrate. We have been a Christian Community for 75 years. By 1875, there were two parishes in Chester - St. Michael's serving the East End and Immaculate Heart serving the West End. Running north to south, Pusey Street is the middle of the city of Chester. St. Michael's Church is located 9 blocks north and Immaculate Heart's Church is located 5 blocks south of Pusey Street, so both Parishes have their Church in the central part of the city. In the late 1800's, this area had the heaviest concentration of people. The following sequence of events charts the course that the German Catholics of Chester pursued for the establishment of a German Church. These facts are taken from a booklet published by the Committee of German Catholics of Chester with Julius Micka as President and William Rehrmann as Secretary. A copy of this booklet can be found at the Rectory with the official historical records of Resurrection Parish. It was in October, 1890 that a Committee representing the German Catholics of Chester first petitioned Archbishop Ryan to organize a German congregation. After almost 8 years, in September, 1898, the Archbishop informed the Committee that a Father Bornemann would come to Chester to investigate the need for another Church. After evaluating his report, the Archbishop decided that there were not enough Germans in Chester to establish a German Parish. In 1900 Committee member, Emil Greismeyer, appealed through a priest in France to the Sacred Congregation of Propaganda in Rome. When they contacted the Archbishop, he promised to form a congregation as soon as economically feasible. In 1904 the Committee of German Catholics petitioned the German Federation of Pennsylvania, and Mr. Robert Schaefges agreed to represent them in their struggle for a Church. They agreed that a census should be taken, so they canvassed the city of Chester. On the first day, Mr. Schaefges was accompanied by Messrs. Hampel, Jacob Schwartz and John Spanier. On the following days, Robert Schaefges was accompanied by William Schlottbaum and Joseph Rehrmann. Their census showed 135 families and 49 single people, in all 726 German Catholics in the city of Chester. The results of this census, taken in May, 1904, were sent to the Very Rev. James P. Turner, the Chancellor of the Archdiocese. Mr. Robert Scheafges of the German Federation received a letter, dated September 20, 1904, from Rev. O. E. Hiltermann, rector of Holy Trinity Parish in Philadelphia. In this letter, the position of the Archbishop was stated to be that he was willing to establish a German and English Parish, but since there was a shortage of German priests, the German Catholics of Chester must have a little patience. The Lord works in mysterious ways for it was on July 26, 1904 that Augustine L. Ganster was ordained a priest at the Cathedral in Philadelphia. On April 24, 1905, Robert Schaefges, Joseph Rehrmann and William Schlottbaum called on the Archbishop to discuss the census taken in May, 1904 at which time the Archbishop stated that he had never received a copy. These men had a copy with them and gave it to the Archbishop. In January, 1906, Rev. William A. Wachter was sent by the Archbishop to Chester to take another census. Mr. Joseph Rehrmann accompanied him as he visited the people of Chester. The Committee was hopeful that their prayers would soon be answered. On July 26, 1906, Archbishop Ryan told four members of the German Catholic Committee that Chester could not support another Church at present, so none would be established. The Committee continued to write letters to the Archbishop, the Apostolic Delegate and the Sacred Congregation of Propaganda. Throughout the years that the Germans were pleading their case, the city of Chester was growing. People of all nationalities were moving into the West End of Chester. Houses were being built from the waterfront to 12th Street. Since Immaculate Heart's Parish Schools was such a long walk, Helen Gillespie (now Sr. Stephen, OSF) and her fellow young Catholics from the West End attended Dewey Public School. In all kinds of weather that was a long walk from 9th and Booth to 2nd and Norris every Sunday, and who could afford the trolley at a nickel a fare! This meant Sunday was spent at Sunday School. They would "hike" to attend morning Mass, come home for something to eat (this was the "old days" when you had to fast from midnight before receiving Communion) and then go back for religious instructions. In the words of Sr. Stephen, "The Archbishop had to do something!" Finally in 1911, the Archbishop declared that another Church was needed in the city of Chester. It would not be established as a German Parish, but would have a German Pastor. Reverend Augustine L. Ganster was serving as assistant pastor of Immaculate Heart Parish when he received his appointment. On January 13, 1911, he was chosen by the Most Reverend Patrick J. Ryan, Archbishop of Philadelphia, to found a new Parish in Chester. It was to be in the neighborhood of the Thurlow Station of the Pennsylvania Railroad (now the Highland Avenue station) with the Parish boundaries extending from Ward Street in Chester to the Delaware State Line, and from the Delaware River to just past Five Points in Aston where our Parish would meet St. Francis de Sales, Lenni. Several sites were examined for the Parish plant and by the end of January, the Bent property on the corner of 9th and Highland was purchased for $10,000. The property ran 465 feet along Highland Avenue and 225 feet along 9th Street. This piece of property was considered large enough for all future purposes. Included in the price was a three-story frame house which served as the first Rectory, and with additions and alterations over the years, it is still used for this purpose. Father Ganster moved into his new home on March 23 and the work to establish a place of worship was begun. The front room on the first floor of the house was 30 feet in length. The rear wall of this room and the west wall of the dining room were torn down. A little frame chapel on West Third Street erected some years before by the German Catholics of Chester was moved to the grounds and placed at a right angle to the dining room. This new chapel could accommodate about 200 people. The dining room of the house was partitioned off; the back part served as the sacristy. The altar was placed against the newly constructed partition. The Holy Sacrifice of the Mass was celebrated in the chapel for the first time on Passion Sunday, April 2, 1911 by Father Ganster with Harry and A. Broomall Ward serving as altar boys. On Easter Sunday, April 16, Father officially announced the name of our Parish to be RESURRECTION OF OUR LORD. Ballinger and Perrot, Architects were awarded the contract to draw up the plans for the school. The building was to be made of granite and located at 10th and Highland Avenue. The basement was to be erected at this time. Meshby & Keating of Philadelphia were to be the builders with the contracts signed on July 7, 1911 and the ground broken on July 11. The last Mass in the chapel was celebrated on November 19. During the following week, the chapel was torn down and the house walls replaced. On Sunday, November 26, at 10 o'clock the first Mass in the new basement Church was celebrated by Father Ganster. The Deacon was Rev. James Timmins of St. Michael's, Chester and the Sub-Deacon was Rev. George Bieulein, a Redemptorist who would open a Mission in the Parish that evening. The cornerstone was blessed by the Most Reverend Edmund F. Prendergast at 4:00 p.m. that afternoon with about 3000 people witnessing the event. Archbishop Prendergast was assisted by Rev. James Timmins of St. Michael's and Rev. Francis J. Herktorn, former assistant at Immaculate Heart. The cornerstone which weighed about 1000 pounds, contains the following: one copy each of the Morning Republican, The Chester Times, The Catholic Standard, The Catholic Times and the Nord Amerika (the German Catholic paper). U.S. coins of the year were also placed in the stone. Also, a manuscript, reading: "In perpetual memory of the event, this cornerstone was laid on November 26, in the Year of Our Lord, Nineteen Hundred and Eleven, by His Reverence, Archbishop Prendergast of the Catholic Diocese of Philadelphia, Pope Pius X, by Divine Providence, governing the Church. William Howard Taft, President of these United States, John K. Tener, Governor of the State of Pennsylvania, David M. Johnson, Mayor of the City of Chester, Augustine L. Ganster, First Pastor of the Church of the Resurrection." After the laying of the cornerstone, Father Ganster led the procession into the new building. He was followed by the Archbishop and many priests from the surrounding parishes and visiting priests from Philadelphia. The Archbishop blessed the interior of the Church after which the male choir sang "Come Holy Spirit." The first sermon was given by Right Reverend Monsignor Philip R. McDevitt, Superintendent of Diocesan Schools. Archbishop Prendergast also preached a sermon. The Very Reverend Peter Masson of Allentown was scheduled to deliver a sermon in German, but his train was delayed and he was unable to attend the ceremony. At Benediction, "O Salutaris" was song by John O'Neill. The choir sang "Tantum Ergo" and the entire congregation sang the closing hymn "Holy God We Praise Thy Name." After the ceremonies, a dinner was held with Archbishop Prendergast as the honored guest. This was the Archbishop's first visit to Chester since his elevation to head the Church of Philadelphia. That same evening, Redemptorist Fathers Bieulein and Hamel, opened a Mission. The first two weeks were in English and the third in German. The are surrounding 9th and Highland was primarily made up of German and Irish immigrants. Each wanted a priest "of their own kind." Some of the Irish were not pleased that when a Parish was finally established in their neighborhood; their Pastor was not "one of them." At Mass, the Gospel was read in both English and German. To protest this double reading, one Irish parishioner would sit down when the Gospel was read in German. When the War broke out, a couple of really stubborn Irishmen made plans to kill their German Pastor. Father Ganster was traveling past a wooded area on his way to visit a dying parishioner in Marcus Hook. The two Irishmen stopped him and said they were going to kill him. Father Ganster asked them to wait until he got back since he was on a Sick Call. Even a hell-bent-on-murder Irishman would not deny a person his "Last Rites." Or, perhaps, it was their Pastor's priestly powers that persuaded these parishioners to come to their senses. Father Ganster was such a loving, kind and caring man that the Irish were won over in a fairly short time. Sunday evening Vesper Services were conducted in German by Father Ganster. Emma Goder O'Donnell (an original and still active parishioner) remembers attending these services with her Austrian immigrant parents. As the Parish grew and people of different nationalities became members of our Parish, the German services were discontinued. The Sacrament of Confirmation was administered for the first time in our Parish on May 1, 1912 by Bishop John J. McCort, D.D. At this time, 142 children and 12 adults were confirmed. In a few short years, the number of Catholics in the Marcus Hook District increased to a point where it became necessary to provide better and more convenient Church facilities for them. Father Ganster rented the Red Men's Hall on Market Street in Marcus Hook for Sunday mornings, and the first Mass was celebrated by him on April 19, 1914. During the time that Holy Saviour was a Mission of Resurrection Church, Father Ganster was assisted in administering to the needs of the faithful by Rev. F. X. Kleiber, OSFS, of Wilmington, Delaware and the Revs. William McLaughlin and Thomas Sullivan. One Mass was celebrated each Sunday. Father Ganster purchased ground in Linwood Heights to build a Church. The contract was awarded to Francis Moore of Chester and ground was broken in July, 1914. The basement and first floor were to be constructed at this time. Mass was celebrated for the first time on December 6, 1914. Dr. Peter Guilda6y of The Catholic University preached the sermon. From this time two Masses were celebrated on Sundays and Holydays. With the growth of industries already there and the establishment of new ones in the Marcus Hook area, more families moved into the area to fill the newly created jobs. Catholics were among them. Father Ganster conducted a census in Marcus Hook, Linwood and Boothwyn and found there were over 110 Catholic families. He decided that Holy Saviour had grown too large to remain a Mission, and he petitioned the Archbishop to send a resident pastor. In May, 1915 the Parish of the Holy Saviour was established. For 6 years, Father Ganster had been planning and saving to complete the school building at 10th and Highland. On April 14, 1917, contracts were let and work begun. Two floors were added to the original building with six classrooms on the top floor to take care of all 8 grades. The middle floor was then used as the Church and the original basement Church became the auditorium. Resurrection School would be under the supervision of the Sisters of St. Francis of Glen Riddle, Pennsylvania. The Sisters of this Community were the first to teach in Delaware County. Living quarters for these sisters were obtained on September 7, 1917 when Father Ganster purchased the Houston property at 719 Highland Avenue. On August 8, 1918 the six Sisters of St. Francis who were to staff our School arrived at the Convent. Sr. Amanda was the principal; she was ably assisted by Sisters Gonzales, Macrina, Maris and Walter, with Sr. Urban as housekeeper. They began their task of getting things ready to provide a Catholic education for the children of Resurrection School. The contractor agreed that the portion of the building to be used for school purposes should be finished first, so that a Flag Raising Ceremony could take place on Labor Day, September, 1918. National and Service Flags were raised with an elaborate program. The American Flag and pole were presented by the Ancient Order of Hibernians of Delaware County. Thomas Sweeney presented the flag to Father Ganster who accepted it in the name of the Parish. The school children and chorus sang "The Star Spangled Banner" and "Flag Salute" while the flag was being raised. There were speeches by the Honorable Eugene Bonniwell, the Honorable William T. Ramsey and the Honorable Wesley S. McDowell, Mayor of Chester. Music was provided by the Swarthmore Band. The members of the Committee who arranged this Flag Raising Ceremony were Rev. Augustine L. Ganster, Peter Guilday, John J. Luttrell, Francis J. Moore, Peter C. Smith, Daniel J. Toohey, H. H. Ward and S. R. Welsh. When the school building was completed, many people were responsible for the furnishing of the School and the Church. Donations from the Holy Name Society, the Rosary Society, the B.V.M. Sodality, the Knights of St. George, Rev. Peter Guilday, D.D. and Father Ganster were used to furnish the six classrooms. For the Sisters' Chapel, the Altar was donated by Mrs. Margaret Lemin, and the Stations of the Cross by Mrs. Ann Riley. The granite building on the corner of 10th and Highland Avenue opened its doors on September 9, 1918. The Sisters of St. Francis at Resurrection School welcomed 96 boys and 92 girls. Since this was the first time Isabelle Booth (now Sr. Ambrose, OSF) and her fellow classmates were attending Catholic School, Sr. Ambrose remembers that they were disappointed when school was closed on October 4 because of the Spanish Influenza Epidemic. School reopened on October 27. The dedication of the school building took place on November 26, 1918. upon his arrival at the Rectory, Archbishop Dennis J. Dougherty, Archbishop of Philadelphia, was greeted by 200 members of the Holy Name Society with John B. O'Neill, President, extending words of welcome. The procession from the Rectory to Highland Avenue and up to 10th Street included several hundred school children and the Holy Name Society with the Archbishop and his assistants completing the line of march. At 10:30 a.m. the dedication ceremony took place in the presence of 2000 people. During the service, the Archbishop praised the untiring efforts of Father Ganster and his parishioners who, in less than 8 years, had raised a building of this magnitude at a cost of $70,000. That afternoon the building was opened for inspection and many people took advantage of this opportunity to walk through the building. They were quite impressed with its design and construction. Father Ganster saw the need for a place for the teenagers to "hang out." So, in the basement of the Church, on January 28, 1919, a Catholic Club was officially opened for the young members of the Parish. It was a place where the young people could meet and have a good time. It was a great place to be. There was a stage for music and dancing - sometimes even a boxing match, a pool table, basketball hoops, a piano, and games of all kinds. Everyone spent their spare time there. When Sr. Stephen was asked the name of the club, her blue eyes twinkled and she replied, "That's it. THE CLUB." Father Ganster opened the doors to all teenagers, Catholic or not. The only teenage problem Sister can remember in those days was a "little smoking." The First Holy Communion Class of 1919 consisted of 48 boys and 40 girls. These students received the Holy Eucharist for the first time from the hands of Father Ganster on May 4. The first Commencement Exercises of Resurrection School were held on June 22, 1919. Each of the eight classes sang a song or did a recitation. Father Ganster presented the following six graduates of the Class of 1919 with their diplomas: Margaret A. Casey, Margaret Fenimore (Salutatorian), Katherine M. Fisher, Alexander J. Gillespie (Valedictorian), John Wm. Maloney and Walter J. Micka. The Sacrament of Confirmation was administered to the school children of Resurrection for the first time on November 3, 1920. Dennis Cardinal Dougherty confirmed 194, 20 of which were adults of the Parish. On April 24, 1921, a three-day celebration began to commemorate the Tenth Anniversary of the Parish. A solemn high Mass of Thanksgiving was sung by the Pastor with Rev. William V. McLaughlin as Deacon and Rev. F. X. Kleiber as Sub-Deacon. The Master of Ceremonies was Rev. J. T. Tucker of Wilmington, who helped Father Ganster with Sunday Masses. The altar boys were Anthony Schulthise, Hubert Keenan, Walter Micka and Adam Schwartz. The sermon was delivered by Rev. Dr. Peter Guilday. The choir under the direction of Leonard Harwood, organist, consisted of George Walker, William Morris, Robert Toner, and Joseph Rehrman as tenors. Clement Morgan and Charles Houston as baritones, and John B. O'Neill as basso. That afternoon there was a program given by the school children in the School Hall. On Sunday evening there were Solemn Vespers at 7:30 p.m. with Father Ganster as celebrant. "It is my proud privilege to say to Father Ganster that the people of the West End of Chester look back with pride at the noble and glorious work he has accomplished in a decade of years. No pastor could have been more solicitous for the welfare, spiritually, morally and mentally, of his people than he, and it is by reason of the affectionate qualities of mind and heart he has shown towards each one of us, that we, his children and parishioners, desire to show in a positive manner the love and respect we bear towards him. ..." (taken from The Chester Times, April 27, 1921). The 8:00 a.m. Mass on Tuesday morning was a Solemn High Requiem Mass for all the deceased members of the Parish. Tuesday evening at 8:00 p.m. there was a Social held for all parishioners. Music was provided by the J. T. Smith Jazz Orchestra. The entertainment was chaired by Joseph Rehrman. The closing exercises of school during our Tenth Anniversary Year were held on June 19, 1921. Sister Lauriana had replaced Sister Amanda as Principal. The enrollment had risen to 285 with 148 boys and 137 girls. Father Ganster presented the following graduates with their diplomas: Webster Abbott, James Galvin, James Maloney, James Meiser - Salutatorian, Agnes Burns, Teresa Casey, May Gillespie, Anna Gilmore, Evelyn Montgomery, Hetty Munzer, Ellen Roney - Valedictorian and Julia Schwartz. Up until this time, Father Ganster had no assistant. On Saturdays and Sundays, the Oblates of St. Francis from Salesianum High School in Wilmington, Delaware came to help him; Rev. Francis Tucker was a "regular." On June 13, 1924 Father Alphonsus B. Conway was assigned to Resurrection Parish. One of the ways Father Conway served our Parish was to form a Dramatic Club for the teenagers. Many joined to display their talents and to have a good time. Enrollment at the close of the school year was 337, with 167 boys and 170 girls. In 1925, because of the ever increasing enrollment, two classrooms were added in the basement. Grades 6 and 7 would now be in these new rooms in the basement. In May, 1926 the Dramatic Club performed a two-act comedy entitled, "All About Betty." Father Conway was the director, and William Morris of the Philadelphia Operatic Society was his assistant. The leading ladies were Mary Grace and Margaret Clarke and the leading men were Vincent Patterson and Paul Maguire. The supporting cast members were: Joseph Baumgart, Isabelle Booth, Leo Booth, John Brennan, Daniel Clendening, Albert Duffy, Anna Gilmore, Winifred GIlmore, James Grace, Mary McCarthy, Anna McGinley, Peg McSweeney, Evelyn Montgomery, Francis Ryan, William Ryan, Dolores Stevenson and William Waldron. The scenery was painted by Joseph Morrow and Joseph Gaynor. As reported in The Chester Times on May 6, 1926, "A capacity house greeted the players of the Dramatic Club." Due to the demand for admission, the actors agreed to a repeat performance the following night. Anna Burns ('26) Lavin remembers that there were 65 students in her first grade class. Of these, 14 graduated on June 27, 1926. Father Ganster presented diplomas to the following: Anna Burns - Salutatorian, Mary Collins, Elizabeth Gill, Catherine Leary, Jennie Horney, Ethel Hoagland, Thomas Clendening, Francis Gallagher, James Gilmore, John Hogan, Leo Keeley, Paul Maloney, Bernard Morris and Hubert Ronan. This was Sr. Lauriana's last year as Superior; she was replaced by Sr. Ernesta. Go to summer school when it wasn't necessary? In the 20's, Catherine Doyle ('30) Moran remembers when she and other Rez students spent some of their summer vacation days out at "The Glen." The Sisters of St. Francis asked for student volunteers to go out there for summer school so that the Novices could get first-hand teaching experience. Their transportation was a flat bed truck provided by H. H. Ward (an active parishioner) who owned a lumber yard at 9th and Booth Streets. The driver was a Jewish man named Moe Rosenberg who told his passengers he was taking them to the Promised Land. After class, each student was rewarded with a cookie. Our own Sr. Xaviera was "in training" at the Glen at this time. A fond memory of Emma Goder ('27) O'Donnell is the Annual Supper which was held in the Armory at 8th and Sproul Streets in Chester. This supper was usually held on Shrove Tuesday. Each table was sponsored by two women who picked young ladies from the 7th and 8th grades to be aides. Along with serving the meals and cleaning up after the supper, the ladies and their aides solicited donations from parishioners in the form of coffee, sugar, butter, cakes, hams, potatoes or money - anything that could be used for the affair. Monday evening was spent making potato salad, cole slaw, baking hams and getting everything ready for the following day. Resurrection Suppers were a MUST for good food. A dance was held after the dinner. In the beginning, Father Ganster administered to the needs of his parishioners with the help of the Oblates of St. Francis from Salesianum High School in Wilmington, Delaware. In 1924, Rev. Alphonsus B. Conway was assigned as his first assistant. By 1936, Father Ganster had three assistants: Father Conway, Rev. William H. Conley and Rev. Anthony Mechunes. How the Parish had grown in those 25 years! The Graduation Exercises for the Silver Jubilee Class of 1936 took place on Sunday, June 21, at 2:00 p.m. Father Ganster awarded diplomas to the following: Thomas J. Battle, Patrick J. Coyne, Albert A. Ewald, Bernard F. Fallon, Thomas F. Ford, Charles A. Hampel, Joseph V. Kasacavage, Thomas J. Keating, Thomas J. Kilcullen, Edward W. Larkin, William J. Luttrell, John J. McGinn, Joseph F. McHale, Joseph R. McHale, David J. Middleton, Francis L. Nester, John L. Olson, John A. Schneider, Dennis F. Sullivan, Walter C. Ziegler, Elizabeth R. BAcon, Florence A. Bailey, Anna R. Boyle, Dorothy K. Creegan, Regina M. Doris, May E. Gavin, Margaret M. Guilday, Mary T. Henry, Margaret E. Keller (Valedictorian), Marie E. Krause, Barbara A. Leary, Mildred L. Luttrell, Elizabeth S. Marcelle, Veronica R. McGinn, Margaret C. Prendergast, Anna T. Quinn, Hilda M. Robinson, Thelma T. Senior, Dorothy M. Smith, Helen M. Smith and Doris J. Young. The Silver Jubilee Celebration began on Wednesday, November 25, with the 8:30 a.m. High Mass celebrated for the school children by Father Ganster. On Wednesday evening, a Parish dinner was held. On Thanksgiving Day, November 26, a Solemn High Mass was sung with Father Ganster as celebrant. The Deacon was Rev. Walter Austin; the Sub-Deacon was Rev. Francis Hennegan. Rev. William Conley was the Master of Ceremonies. Rt. Rev. Peter Guilday of The Catholic University in Washington, D.C. delivered the sermon. On Thanksgiving evening, a Parish Dance was held in the hall. On Friday morning, a Solemn Requiem Mass for the deceased members of the Parish was celebrated at 9:00 a.m. by Father Ganster. Rev. William Conley was the Deacon; Rev. Anthony Mechunes was the Sub-Deacon. That evening, a Parish play was given by the Dramatic Club. Father Ganster was too ill to attend the Graduation Exercises of 1938. This was the first time that he had not awarded the certificates and diplomas since the first graduation in 1919. For 27 years, Father Augustine L. Ganster worked long and hard to make the Parish he founded a vibrant part of the West End Community. His efforts were rewarded but his health began to fail. He died on the Feast of Corpus Christi, June 16, 1938, at 5:10 p.m.
Father Ganster's will, dated July 24, 1937, begins, "I desire my funeral to be as simple as possible. No sermon." On Friday, August 19, 1938, the Very Rev. Monsignor Francis E. Hyland, J.C.D., was appointed our new Pastor. Prior to his appointment, Monsignor Hyland had been secretary to the Apostolic Delegation in Washington, D.C. for ten years. He arrived at Resurrection on September 8, 1938. On Tuesday, November 29, 1938, the Apostolic Delegate to the United States, The Most Rev. Amleto G. Cicognani, D.D., was the guest of Monsignor Hyland. This was the first time a personal representative of the Pope had ever visited Chester. Services were held that evening at 7:30 p.m. After the procession into the filled-to-capacity Church, Monsignor Hyland presented the Most Rev. Cicognani to the congregation. Devotions began with the Rosary and the Litany. After a brief talk, the Apostolic Delegate, acting as the representative of Pope Pius XI, conferred on Monsignor Hyland the rank and title of Domestic Prelate. This honor, which is one of the highest to be conferred upon members of the clergy, came as a complete surprise to our Pastor. The Most Rev. Cicognani officiated at Benediction and bestowed the blessing of the Holy Father on the entire congregation. Among the large number present were priests from the surrounding parishes: Rev. Joseph O'Hara of St. Michael's, Rev. Peter Stewart of Immaculate Heart, Rev. James V. Mulhern of St. Robert's, Rev. John Zazzara of St. Anthony's and Rev. Hugh P. Reid of Holy Saviour. On March 21, 1939 the first monthly calendar was issued. This first issue was dedicated to the memory of Father Ganster. The Cyrenian Society was also inaugurated in 1939. Its purpose was to collect weekly contributions from each worker toward a fund to build a new church. Each worker was asked to contribute 25 cents. Today we have the Cyrenian Collection on the first Sunday of June, July, August and September to help offset the expenses of the summer months. The suggested offering is $5 per month. On June 2, 1940 one hundred members of the Holy Name Society attended the Golden Jubilee Mass of his Eminence, Dennis Cardinal Dougherty, at the Municipal Stadium in Philadelphia. They were among the 50,000 men who marched in the Grand Holy Name Parade down Broad Street from Washington Street to the Stadium. In March, 1941, Monsignor Francis E. Hyland was re-assigned to Our Lady of Lourdes in Philadelphia. While Pastor at Resurrection, he was known for his humility and for his interest in the Chester community. He gave overwhelming support to the sports program fostered by the Resurrection Boys' Club. Rev. William Conley was the moderator of the athletic program, and Monsignor Hyland was a great friend and supporter of the boys who participated in the various activities. Before Monsignor Hyland left on the afternoon of March 25, his replacement, Rev. Terence A. Brady, arrived. Before coming to Resurrection, Father Brady was Diocesan Director of the Catholic Young Organization and Spiritual Director of the Catholic Young Men's Organization of Philadelphia. The 30th Anniversary Celebration began on Sunday, November 2, 1941, when Father Brady celebrated a Solemn High Mass at 11 o'clock with Rev. William H. Conley as Deacon and Rev. E. Ward Knebels as Sub-Deacon. Rev. Joseph Murray was Master of Ceremonies. Monsignor Hyland was present in the Sanctuary. The sermon was delivered by Rev. Francis Tucker, OSFS, Pastor of St. Anthony's in Wilmington, Delaware. Father Tucker helped Father Ganster with Sunday Masses for many years, and in his sermon he paid a glowing tribute to the loving memory of our Founding Pastor. The Boys' Choir, under the direction of Sr. Francis Assisi, sang the Mass. After the Mass, the entire congregation marched in procession to the grave of Father Ganster where the memorial statue of the Sacred Heart which marks his grave was blessed by Monsignor Francis E. Hyland. That evening over 250 parishioners gathered at the banquet table. After the diner. Mr. H. H. Ward introduced the speakers among whom were four former assistants: Revs. Alphonsus Conway, Leo Mitchell, Francis Hennegan and Anthony Mechunes. They came back to help us celebrate! After the speeches, the school children put on a play highlighting the important events of the Parish since its beginning. On Monday morning, a Requiem Mass was celebrated by Father Brady for the deceased of the Parish. In the evening a dance was held for the young people of the Parish. A suggestion was made to form an Alumni Association for graduates of Resurrection School. Tuesday evening was Parish Night for all members, both young and old. The celebration came to a close with an Irish-American dance. With the erection of McCaffrey Village and Highland Gardens, the number of Catholics living within the Parish boundaries greatly increased. When the houses in those two areas were ready for occupancy, the priests visited the homes of the new parishioners and blessed them. New families meant more children in our school. Over-crowded conditions, appreciated mostly by the Sisters who taught in the school, existed in all grades. During the summer, four classrooms were added in the basement. Extra Masses were added to the Sunday schedule. When this wasn't enough, a double Mass schedule was put into effect - one in the Church and one in the basement. During the War, the young men and women serving in the Armed Forces were not forgotten. Each Sunday evening, the Novena of the Miraculous Medal was recited for peace and the safe return of those serving their country. At Christmas time, a small gift was sent to all whose addresses were known. A memorial shrine was erected by a group of willing men from the Parish to honor those who served in the Armed Forces. It is a grotto of Our Lady of Lourdes and is on the front lawn of the Convent, facing 9th Street. Father Brady saw that it was time to build the Church. The ground for the new Church at 9th and Highland was blessed and broken on August 8, 1948 by Monsignor Francis J. Ross, Pastor of St. James Church in Philadelphia. The ceremonies were attended by more than 300 people. As one of the oldest parishioners Michael Goder, father of Emma Goder O'Donnell, was asked to turn over a spadeful of dirt. Erection of the building was to begin immediately and it would have a seating capacity of 800. The church was designed by Peter F. Getz of Philadelphia and construction contracts were awarded to John P. Donavan, Inc. The Church structure is made of granite and Indiana limestone. The style is quasi-Celtic, Romanesque. The vaulted roof is of Spanish tile. The stained glass windows, designed by Joep Nichols, depict scenes from the life of Christ with the one over the entrance to our Church being the Resurrection. The Stations of the Cross are of Celtic design and were hand carved in Italy. The Main Altar consists of three types of marble: Bottochino, Biancho and Verde Maurin. Over the Main Altar is a canopy of brass with a gold finish. Four pillars support this canopy whose interior is painted deep blue sprinkled with gold stars. A full length brocade backdrop hangs behind the altar. There are three side altars. The Altar of Our Lady is on the left on the side wall and the Altar of the Sacred Heart is on the front left. The Altar of St. Joseph is on the right side of the Main Altar. The statues are wooden and were hand carved in Italy. All woodwork throughout the Church is of white oak. Terrazza (marbilized flooring) is in the sanctuary, the aisles and the vestibules. Asphalt tile has been used in the pew space and in the sacristies. The sanctuary gates and all other metalwork are of Swedish wrought iron. Bishop J. Carroll McCormick, auxiliary bishop of Philadelphia, laid the cornerstone and formally dedicated our Church on November 20, 1949 with ceremonies beginning at 11 o'clock. Chaplains to the Bishop were the Rev. Joseph M. O'Hara and Rev. James A. Donnelly. Bishop-Elect Francis E. Hyland returned to celebrate the Solemn High Mass. He was assisted by Rev. John J. McKenzie as Deacon and Rev. Michael J. McLaughlin, O.Praem., as Sub-Deacon. The Master of Ceremonies was Rev. Charles F. Martin, assisted by Rev. Michael A. Boyle. Chanters were former assistant priests, Rev. Louis Eltz and Rev. Thomas Loughrey. That afternoon the Our Lady of Lourdes Shrine, located in the front yard of the Convent facing 9th Street, was dedicated with Monsignor Cornelius P. Brennan presiding. He was assisted by Rev. Thomas J. Wootten as Deacon and Rev. Gerald McDevitt as Sub-Deacon. This grotto is a memorial shrine erected by a group of willing men from the Parish to honor those who served in the Armed Forces. During our annual May Celebration, this statue of Our Lady is crowned as well as the one inside the Church. A Parish banquet was held in the evening during which movies of Lourdes were shown. The years that followed were spent fund raising to pay for the maintenance of and improvements to the many buildings we now had in our Parish Plant. Father John J. McKenzie was Father Brady's right-hand man in overseeing the various fund raising activities conducted. An annual Card Party was held in the Spring. The various organizations of the Parish supplied the manpower to run the events. The Card Party in 1953 was held on Thursday, May 28. An Annual Harvest Fair was held in the Fall. In 1954, the Harvest Fair began on Wednesday, November 27, and ran through Saturday. The Parish Groups involved were the Mother's Guild, the Holy Name Society, the Sodality and the Christian Family Group. The festivities began with a "Gay Nineties" Party on Wednesday evening. Rez night was Thursday evening with pictures of previous happenings in the Parish, the Harvest Hop was held on Friday evening, and there was a Games Party on Saturday evening. Friday and Saturday afternoons from 2 - 4 p.m. were devoted to the children. Workers at this Harvest Fair were Ann Lawler, Daniel McGinn, Agnes Marth, Mrs. Martin Smith, Jr., Mrs. Anthony McLoughlin, Bridget Wren, Mrs. Joseph Rupertus, Mrs. Joseph Liberato and William Leary, with Mary McGreal serving as Treasurer. The Winter blahs were temporarily chased away when February came around and it was time for the Mother's Guild Minstrel and Dance. Music was provided by Caruso's Orchestra. On February 23, 1954 the second annual affair was under the direction of Emma O'Donnell with Mary Coyle as her assistant. The interlocutor was Aloysia Palma. Some of the performances were: "I Double Dare You" by Marie Raftovich, "Granada" by Judy Smith, a Soft Shoe Dance by Alice Green and "Changing Partners" by Josephine White. The entire company performed the Finale - "Live Every Moment." The show in 1955 was held on February 22 under the direction of Milt Howett and Mary Coyle, with Ann Lawler as the interlocutor. A few of the acts were: "Moonlight and Roses" by Mary Grace, "If I Had My Way" by Anne Stevenson, "Indian Love Call" by Angela McDonald and a dance to "The Momma Doll Song" by Dorothy Warder. The FInale was "Mr. Sandman" performed by the entire company. February 14 was the date of the Minstrel Show in 1956. The directors were Mary Coyle and Milt Howett with Emma O'Donnell as interlocutor. On the program were: "It's a Sin to Tell a Lie" by Mary Czach, "One Alone" by Leona Lynch, "Louisville Lou" by Margaret Leary and "Rock and Roll Waltz" by Mary Wood. The entire company performed the Finale - "Darktown Strutter's Ball." In 1957 when Father Brady suggested that the Mother's Guild change its name to the Women's Club, the Minstrel Show became the Variety Show. Our school enrollment was ever increasing; we needed more space. An Annex was built in 1956 behind the Convent. Assumption Annex, as it was named, contained 7 classrooms, an office and a meeting room. More children meant more faculty, and the Convent was enlarged to its present size. Some of the money raised through the various fund raisers was put aside to repaint the Church since our 50th anniversary as a Parish was fast approaching. Members of the Parish were asked to pledge the money needed to redecorate the Church. On May 2, 1961, the Women's Club presented a Variety Show in the School auditorium with Ida Mae Cassidy as the Interlocutor. The directors were Milt Howett and Mary Grace ('20) Coyle. Doris Venables and Anne Stevenson handled the ticket sales. The Chairman of the Refreshment Committee was Ann Lawler. The spotlight was operated by Julian Messick. It was a great success and the performers enjoyed putting on the show. The End Men were: Kathleen Bingnear, Laura Eyre, Ann Francis, Kathleen Macuk, Bernice Schwartz and Norma Szper. The Front Line were: Mary Coyle, Joseph Dolan, Mary King, Angela McDonald, Maureen O'Connor, Al Palma, Cathy Palma, James Sheeky, Judy Smith and Maureen Smith. Every show needs a Chorus. These were: Rosemary Bachle, Margaret Bajzik, Margaret Barnum, Margaret Bennington, Loretta Black, Margaret Bocelli, Betty Bramble, Dorothy Burn, Eva Chambers, Mary Cook, Marie Correia, Theresa Diehl, Ann Dixon, Judy Ford, Kay Galvin, Fannie Garofalo, Dolores Gasparetti, Eleanor Gehling, Sally Haines, Dorothy Hall, Helen Hanavin, Ann Herman, Sandy Kaminiski, Margaret Kiley, Dorothy King, Betty McCloskey, NOreen McGlinchey, Sadie Mylett, Margaret Nardone, Betty Nuttall, Marion Reaves, Julia Ross, Sally Ryan, Rose Shurgailo, Sarah Sorgi, Mary Specht, Mary Steppke and Betty Wetzel. Father Brady placed Father John Duffy in charge of repainting the interior of the Church. The colors chosen were dusty rose pink for the walls and a deep rose for the sanctuary. On the wall behind the statues of Our Lady, the Sacred Heart and St. Joseph, a design was painted to frame the statue. A heavy red drape was hung down the full length of the back of the canopy over the altar, and valances with gold fringe were hung on the three sides. The ceiling was most unusual. The soft pastel colors found in the sunset were used to paint the strips of wood. There was no apparent set pattern for the use of the colors. This work was completed in time for the 50th Anniversary Mass. The Golden Jubilee Mass was celebrated on Saturday, October 21, 1961, with the Most Reverend John J. Krol, Archbishop of Philadelphia, as the celebrant. his assistant was the Rt. Rev. Msgr. Casimir F. Lawniczak, Pastor of St. Canitius in Philadelphia. Former assistants, Rev. Francis P. Lennon and Rev. Thomas J. Wootten served as Deacon and Subdeacon, respectively. There were also two Deacons of Honor: The Rt. Rev. Msgr. James V. Mulhearn, Pastor of St. Robert's in Chester and the Rt. Rev. Msgr. Thomas J. Kelley, Pastor of Nativity B.V.M. in Media. The sermon was preached by a former resident of our Parish, the Rt. Rev. Msgr. Gerald V. McDevitt, Secretary at the Apostolic Delegation in Washington, D.C. The Master of Ceremonies was Rev. James F. Connelly, Secretary to the Archbishop. The Assistant Master of Ceremonies was our own Rev. John J. Duffy. On the following day, the Sacrament of Confirmation was conferred on 218 school children and 15 adults by Bishop Francis J. Furey, Auxiliary Bishop of Philadelphia. That third weekend in October, 1961 was certainly one of joy and thanksgiving for our Parish. The years following the Golden Jubilee were fast moving ones in terms of pastors. For our first 50 years, we had 3 pastors; in the next ten, we would have 3 more. Father Brady retired in 1965 and Rev. William Humes became our pastor. Every school needs a library and through the determination of Sister Jeanette Francis, one was established in our School. In February, 1966 the school library, located in the Annex, was named the Sr. Jeanette Francis Memorial Library in her honor. Mrs. Helen Lewis has been the librarian from the start, and she is still carrying on the spirit of Sr. Jeanette by helping Rez students find their way around the library. The reading groups of each classroom have an assigned library time every week. Passes are also given to the students in the higher grades to do research work during school time. Parents are asked to be library aides and the most faithful is Nadine Maher ('69) Scarpato whose four sons attend Rez - Paul in 6th, Martin in 4th, Nicholas in 2nd and Timothy in 1st. Every year on the second Sunday of June, a special collection is taken up at all the Masses to buy more books for the library. In April, 1968 Father William Humes called a meeting to lay the groundwork for a Home & School Association at Resurrection. The purpose of this organization would be to help the teachers with the paper work and to assist the teachers in the classroom. The Executive Board would consist of the President, Vice-President, Recording Secretary, Pastor and Principal. The first officers were John Moletteri, Ted Killen and Joan Klinger. During this same year, our Parish was part of a pilot program for the deaf. At one of the Masses on the second and fourth Sundays of the month, Rev. Anthony Russo, a Redemptorist, would "sign" the Mass while Father Humes celebrated it. On June 22, 1968, during one of these Masses, 7 deaf children received their First Holy Communion. A Student Government was formed in our school in September, 1968. Students from the 7th and 8th grades ran campaigns for the various offices. After the votes were counted, the following were elected: President - John Lombardo, Vice-President - Rick Christy, Secretary - Maria Del Pizzo and Treasurer - Andrea Getek. Their suggestions and ideas were brought to the attention of the Executive Board of the Home & School Association by Ted Killen, Howard Abbott and Ed Maher who served as their technical advisors. The titles have changed but the Student Government is still active today. For the school year 1986-1987, Sonal Shah of the 8th Grade is Commissioner General and Michelle Pitt of the 7th Grade is the Assistant Commissioner General. There are also Commissioners of Publicity, Finance, Athletics and S.I.G.N. (Service In God's Name). Mrs. Susan Macuk ('71) Lowe, the 8th grade teacher, is the Faculty Moderator. Father Humes was very well liked, so it was a big shock to everyone when he died suddenly in December, 1969. The Home & School Association wanted to honor him in a special way, so in January, 1970 the Father Humes Award for Sportsmanship was established. A plaque would be awarded to the boy and the girl in the graduating class who best displayed this quality. A wall plaque hangs in the school library with the names and year of the recipients inscribed on the plaque. The first to receive this award were Michael Owsiany and Dena Shaw, Class of 1970. James Ostan and Karen Plunkett were chosen to receive the Father Humes Award in 1986. Rev. Paul Mihal was named our new pastor. He was introduced to the parents of the school children at the Home & School meeting in February, 1970. The gibbest drain on the Parish budget is the running of the school. For this reason, in May, 1970 with the guidance of our ew pastor, Father Mihal, the Executive Board of the Home & School Association set up a tuition schedule. These tuition rates went into effect for the 1970-71 school year. The first tuition payment consisted of a $20 book rental fee and a $5 monthly contribution per family to a special Sunday collection. Father Mihal was transferred in October, 1970 and Rev. John J. McKenzie was appointed our new pastor. He had been an assistant in our Parish from 1943-53. Father John McKenzie was introduced to the membership of the Home & School Association at the December meeting. The choir was formed in March, 1972. They were ready to sing as a group for Holy Week Services. For the 1972-73 school year the book rental was dropped but the tuition was raised to $25 per child at registration and $10 monthly per family from October through May. At the start of the school year in 1973, Father Joe Anderlonis re-instated the Children's Mass. The 9:30 a.m. Mass on the first Sunday of the month from October through June was designated as Children's Mass which all school children were expected to attend. Members of the Home & School Association provided the adult supervision. During the Summer of 1977, from August 21-26, a Parish carnival was held on Sun Oil Property at the corner of Dutton Mill and Pennell Roads in Aston, PA. The members of the various organizations in our Parish staffed the booths. Father McKenzie was the coordinator and he kept things running smoothly. He was assisted by Father Craig Brugger, then in residence, now principal at St. James High School in Chester. The success of the carnival was due to the team effort of all - those who worked and those who came to enjoy the many games and rides. With the increased cost of heating and lighting, Father McKenzie made plans to turn one of the rooms behind the sanctuary into a chapel. George Closs and his assistants, under the direction of Father McKenzie, changed a storage area on the Highland Avenue side of the church into a small but adequate chapel. The banners which decorated the walls were the work of Penny Trasatti. Daily Mass was held in the chapel which consisted of two rows of pews on either side facing each other with the altar placed in the middle along the driveway wall. Sister Ann Rosaire, principal from 1976-81, set the wheels in motion for the establishment of a Kindergarten. In September, 1978 this became a reality with Miss Paula Manerchia as the teacher of 29 pupils. The classroom in the Annex next to the library was equipped with all the things necessary to make Kindergarten a fun as well as learning experience. Another of Sr. Ann Rosaire's dreams was a cafeteria for the school children so that they would not have to eat their lunch in their classrooms. The cafeteria would be located in the Annex, the first room on the right, across from the library. Through the Archdiocesan Nutritional Program, all the necessary equipment, such as the oven, refrigerator and freezer, was purchased and installed. In March, 1978 the Hot Lunch Program began with Dorothy Coale as supervisor. The cost of the hot lunch is regulated according to family income. Whether you bring your lunch or take advantage of the hot lunch program, everyone eats in the cafeteria during three scheduled lunchtimes. The cafeteria is staffed by a group of loyal women who come everyday to serve the lunches. Esther McKinney has been the cafeteria supervisor since 1980; she retired in 1986 and her daughter-in-law, Gloria McKinney, took over the reins. By 1979 one-half of the school children were non-Catholic. A tuition schedule was set up for parishioners and non-parishioners. The parishioner rate is based on family participation and their contribution to the Sunday collection. If a family does not participate in the activities of the Parish, they are put on the non-parishioner list and are asked to pay the higher non-parishioner rate. Due to Father McKenzie's failing health, he became a resident of St. Joseph's Villa in Darby and Rev. Ignatius L. Murray was named Administrator on February 16, 1982. Sister Kathleen McCabe became principal in 1981 and she began the task of establishing a Learning Center in our school. This would be more complete than the resource centers in the individual classrooms. In 1983 the Learning Center in the basement of the Main Building was opened with Sr. Deotilla in charge. She was ably assisted by Mrs. Betty Weigand, whose five children attended our School with the youngest, Nancy, graduating in 1981. Improved reading skills is the main function of the Learning Center to date. Since reading is essential to master all other subjects, this is the ideal starting point. On January 15, 1985, after a relatively short bout with cancer, Sr. Deotilla died. In May of that year, the Learning Center was dedicated to her because of her untiring efforts to instill in Rez students the necessity of good reading skills. Sister Jean Margaret composed a poem read at Sr. Deotilla's funeral Mass, and that poem along with her picture is displayed in the Learning Center. Sr. Dennis Michael is now in charge of the Learning Center, with Betty Weigand as her assistant. Many children need extra motivation to stay in school. For this reason, Mr. James Quigley, a career counselor, has been assigned to our School through a grant from the Sun Oil Company. He started counseling our children in September, 1983. He meets with the students from Grades 5-8 at various times on Tuesday and Thursday. We share Mr. Quigley with Immaculate Heart of Mary in Chester where he also spends two days a week. The children have responded well to him because he shows a genuine interest in them. Usually career counselors deal with high school students, but it was felt that our area could benefit from the work of such a dedicated person at an earlier age. During the Summer of 1984, the Principal's Office and the Main Office in our School were relocated. They are now located just inside the door as you enter from the schoolyard. The office is staffed by Emma O'Donnell, school secretary, and Sr. Marie Matilda, the office assistant. The Principal's Office is behind the Main Office. Half of the profits from the Christmas Sales Drive run by the Home & School Association through the school children in 1984 was given to Father Murray toward the cost of these new offices. At the same time the new school offices were being built, Father Murray saw the need for a bigger chapel. A ten-foot high was was constructed about four feet behind the sanctuary, creating a walkway. The area behind the newly erected wall and the existing wall became the sacristy. The former sacristy was painted and carpeted. The chapel was then moved from the left side to the right side of the church. The altar is along the back wall of the church. There are 5 rows of 8 chairs with a small aisle down the middle and either side. The church door across from the side door of the Rectory is now the entrance to the chapel. Computers arrived at Resurrection School during the 1984-85 school year. The Faculty Room in the basement of the Main Building was transformed into the Computer Lab. The 11 Radio Shack TRS-80 computers in our Lab were on loan for one year through a grant from the Archdiocesan office. We were informed the following year that the archdiocese had purchased these computers, and they were now the property of Resurrection School. Sister Mary Ann is the resident computer expert. The money raised by collecting Tri-State Thriftway Tapes is used to buy the software. Our Diamond Jubilee was fast approaching. Many activities would be held during the coming year commemorating this milestone, with a Jubilee Mass and Parish Banquet on October 26, 1986 as the grand finale. In the Fall of 1985 Father Murray formed a Prish Restoration Committee. The goal of this Committee was to obtain pledges from Resurrection parishioners to be donated over a 3-year period for the restoration of the Parish buildings. Top priority was the repainting of the Church. The co-chairmen of this committee were Marie Creedon and Vincent Fanelli. The Team Leaders were: Genevieve Abbott, Howard "Bud" Abbott, Margaret Calhoun, Leo Carroll, Frances Closs, John Flannery, Theresa Kistler, Susan Lowe, Ann Markiewicz, Andrea Moyer, Emma O'Donnell, Anne Stevenson, Penny Trasatti and Mary V. Watson. Without the time and effort of the following workers, the campaign goal of $75,000 could not have been reached: Ann Abbott, Sam Armstrong, Carolyn Armstrong, Donna Boroi, Gail Brown, Margaret Brown, Yolanda Bush, Tom Chambers, Roselind Davis, Margaret DiMartino, Marie Duffy, Mary Ebling, Samuel Emmi, Marie Emmi, Jerry Fedena, Josephine Fisher, Dorothy Grimm, Jose Hernandez, Pamela Hernandez, Cecilia Hrubovcak, Elizabeth Jaworsky, Tom Joyce, Ann Joyce, Rose Kelsey, Marie Kokoszka, Michael Kordowski, Helen Lewis, Frank Lewandowski, Cyndi Lewandowski, Sally Louden, William Louden, Mary MacDonald, Patricia MacDonald, Kay Macuk, Edith Maguire, Mary May, Edna McKay, William McNamee, Anthony Miele, Barbara Miller, William Misiewicz, Josie Moore, Margaret O'Donnell, Robert Plunkett, Mary Purdy, Mary Queensberry, Alberta Ravert, Eleanor Rzasa, William Schaefer, Anthony Selletti, James Solomon, Virginia Swinick, Norma Szper, Robert Trynovich, Wanda Trynovich and Denise West. Bishop Edward T. Hughes administered the Sacrament of Confirmation on Friday, November 8, 1985. There were 34 students who had prepared themselves by studying their Confirmation Instruction Booklet and performing acts of Christian service. They were now ready to be made Soldiers of Christ. The boys wore red robes with white stoles and the girls wore white with red stoles. These stoles were made by the Confirmandi. On the left side of the stole were symbols of the Holy Spirit and on the right was the name chosen to be his/her Confirmation name. Some took an active part in the Mass. James HOuser did the First Reading. Amanda Moyer read the Responsorial Psalm with Michael Schaefer chanting the Response. The Second Reading was done by Albert Ravert. Julie Watson and Donna Mattero read the Prayer of the Faithful. The following received the Sacrament of Confirmation on this day: Tara Armstrong, Patricia Borcky, Khristeena Brown, Tracy Chambers, Duane Cook, Taren Daniels, Paul DiMartino, James Donahue, Sean Estock, Jennifer Gaudino, Sunny George, Natalie Hernandez, James Houser, Brandace Kane, Samantha Kranyak, Joseph Lombardo, Donna Mattero, Amanda Moyer, Robert Myers, Mark Nygard, Donald Paterson, Michelle Pitt, Albert Ravert, Billie Relyea, Bryon Relyea, Robert Roman, Paul Scarpato, Michael Schaefer, Jeffrey Schopfer, Tiheshia Scott, Barbara Shade, Tina Suter, Michael Trader and Julie Watson. After the Confirmation Mass there was a reception in the school cafeteria for the priests who had come to join in our celebration. The first Saturday in February was Appreciation Day for the parishioners who are members of our various organizations. Each member was asked to bring a covered dish to the dinner held in the school hall, so there was a wide variety of food. The Sisters of our Parish decorated the hall and prepared a short prayer service for Father Murray. The Sisters presented him with a beautiful stole commemorating his being named Pastor. The committee members responsible for a successful Appreciation Day were Sr. Jean Margaret, Genevieve and Bud Abbott, Andrea Moyer and Mary V. Watson. Group pictures were taken by George R. Watson, photographer for the Blue and Gray, the St. James High School yearbook. Father Tom McGann took the pictures when George was part of a group. A special thank you to those who shoveled all that snow so that there was a clear path from the schoolyard to the hall. The shovelers were George, George R., Tricia and Barbie Watson and Father Tom. During Catholic Schools Week, on March 16 at 10 o'clock, a Reunion Mass was celebrated by our Pastor, Father Murray. The Entrance Procession was composed of members of our Parish community. Marie Creedon is President and Roselind Davis is Treasurer of the Women's Club. Penny Trasatti represented the Altar Society, Mary V. Watson is President of the Home & School Association, Emma Goder ('27) O'Donnell represented the School Office Staff, Susan Macuk ('71) Lowe is on the Teaching Staff, and Patricia Watson ('84) represented the CYO. Daniel Emmi ('84) and George Watson ('82) served as altar boys. The readings were done by Robert Davis ('67) and Barbara Watson ('85). Many alumni attended the Mass after which there was a reception in the school hall to renew friendships made while attending Resurrection School. The hall was decorated in green and white, of course, with a big Welcome Alumni Banner hung across the curtain on the stage. As you can tell by the pictures, we had a good turnout. Many signed the Reunion Register before leaving. We have had three Healing Masses for our sick and shut-in parishioners. The Sacrament of the Sick has been administered after each of these Masses which have been held on September 26, 1985, April 19, 1986 and October 11, 1986. Parishioners volunteered to provide needed transportation. After the Healing Mass on April 19, a reception was held in the Chapel. Many of those who attended the Mass came to enjoy each other's company. The CYO under the direction of Sr. Jean Margaret provided and served the refreshments. Throughout its history, the appearance and the manner of the May Procession has changed. What has remained constant is the deep devotion to Mary which has been passed on by generations of Resurrection families. Since 1969, the May Procession has been on a weekday in May. The Principal and the Pastor decide which day it will be; in 1986, the May Procession was held on May 7. With their names pulled out of a box (hats are old-fashioned), Donna Suter was named May Queen and Erick Moyer was chosen May King. In the 20's, the parish picnic was held on the grounds of the Clayton Mansion where Sacred Heart Hospital now stands. A tradition of parish picnics continued through the years. In 1943 the picnic was held at Riverview Beach, New Jersey. On June 10, Rez parishioners traveled to the foot of Market Street in Chester to board the Wilson Line for a cruise down the Delaware River to Riverview for a day of fun at the picnic grove and on the amusements. Father Joe Anderlonis organized the parish picnic of 1973. It was held on June 3 at Clayton Park, on Garnet Mine Road just off Route 322. Plenty of games and good food were the order of the day. Father John Lyons and the Family Life Group organized a parish picnic to Johnson Park in Trainer in June, 1978. Father James Gorman was the man in charge of the parish picnics of 1984 and 1985. This year it was held at Henry Johnson Park, off Township Line Road, in Trainer. The weather was great and the food tasty. A softball game, badminton, a lollipop hunt, face painting, and games for the younger set were the planned activities. During the afternoon, Andrea Moyer distributed a water ice treat. To top off a beautiful day, Father Tom McGann celebrated Mass using a picnic table as the altar. There was true community spirit and everyone enjoyed themselves and each other. We thank the members of the Picnic Committee: Father Tom, Sr. Jean Margaret, Marie Creedon, Susan Lowe, Andrea Moyer and Mary V. Watson. Our church's new interior is the result of the artistic creativity of Don Mulvihill, whose other works include the chapel of St. James High School in Chester. The summer months of Carlos Rivas, our sexton's assistant, were spent painting. Everything is now an off-white color - the ceiling, the walls and the sanctuary. The statues of Our Lady, the Sacred Heart and St. Joseph are mounted on a dark wooden background accented by an ivory border. The beautiful stained glass window of the glorious Resurrection above the main entrance of the church is accented with an ivory border with a cross superimposed on it. The walls surrounding the windows on the sides of the church are now painted black for a shadow-box effect. The middle section of the altar rail has been removed for easier access to the altar. The base of the altar has been extended and covered with new carpeting. The handiwork of Penny Trasatti and Marie Creedon is evident in the full-length drape of deep cobalt blue which hangs behind the altar. There are no valances on the sides of the canopy over the altar so that the ceiling of the canopy, which is painted a light cobalt blue sprinkled with gold stars, may be seen and appreciated. There is a feeling of openness and warmth inviting everyone to the Altar of the Lord. The feast of St. Francis is a special day at Resurrection School. This year on Friday, October 3, at 1:00 p.m. a prayer service for world peace was held. The celebration included a procession from church up Highland Avenue to the schoolyard on 10th Street which was led by 5 students holding streamers attached to the Peace Balloon. Father Tom and a number of students spent a good deal of time drawing the world on a giant helium-filled balloon. On the morning of Peace Day as the children waited for the festivities to begin, a bumble bee burst the "world" with one shot of its stinger! Father Tom was able to obtain regular sized helium-filled balloons as a replacement and the Peace Service began on time. After a short prayer service, the balloon was launched sending the student's peace greeting across the sky. Recollections: "Many people should remember Elizabeth Rivan, she was the housekeeper in the very early days of the parish, served for many years in that role, retired, and then was talked into coming back in the 70's by Fr John McKenzie. (He loved her cooking!!) She worked for many more years until she could no longer work and retired again the Delaware. She was a wonderful person to know, I worked for her at the Rectory for 5 years. Also a very well remember person should be Jim Hill. He was the custodian and many of us remember being yelled at by him to get of the grass!!!! He did a wonderful job keeping up the beautiful church grounds." "I remember singing in the Choir which was located behind the Altar. Can't remember the Nun who conducted us. And Christmas midnight Mass with the Church dark and in candlelight only, as the Priest, Altar Boys and Choir entered the center aisle in procession was really special. "There was a few years when the Mass was held at 3 or 4 AM Christmas morning instead of at Midnight. I recall trudging up 10th Street to the Church to sing at a few of those Masses." "My grandparents Rose and Joseph Schulthise belonged to Rez. parish at time the mass was in latin but gospel sermon etc. was in German." 1 - Thanks to Caroline for this information. � 2000, 2001, 2002, 2003, 2005, 2006, 2007 John A. Bullock III.